This photo of Flowers is from my Mothers Day Bouquet. A Gift from my family. Whether you are a new or mature Christian, I pray that God will bless you as you read from these pages. It is good to learn more of God’s Word day by day. 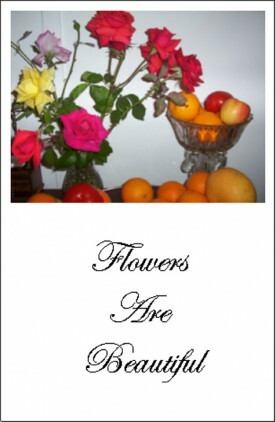 A Bible Quote will be put on most pages or posts of this Blog, with a photograph of some of God’s flowers in various arrangements. Nearly all were ready to be taken to Church and put on the Altar. and can give much pleasure to many people. Sometimes it is good to give a flower to a person to take home after the Service. Many have appreciated this small gesture, especially if they are feeling ill, recovering from an illness, or visiting the Church whilst on Holiday. Or give to a member of the Congregation for them to have a Happy Day! If possible let them choose their favourite Rose or Bloom to take with them as a Gift for the day. It is far better to give – than leaving them in an empty Church for the week. I pray that you, yourself, will find time to look and see the flowers around you, the beautiful colours, the lovely petals and shapes plus the wonderful perfume. Find time to Smell the Roses. This entry was posted in Uncategorized and tagged Altar, Basket, Flowers, God Bless, photo of Flowers, Rose. Bookmark the permalink.